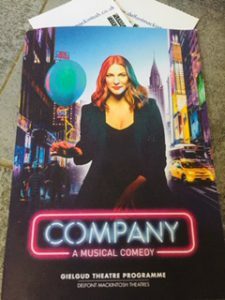 Leading the way in the musicals after a phenomenal run at the Gielgud Theatre is Marianne Elliot’s reimagining of Stephen Sondheim’s Company. This is the first production to re envision Bobby as a single woman in her mid-thirties, who has not yet settled down with the right man, much to the consternation of her married friends. In a BBC radio interview last year, Sondheim admitted that when Marianne Elliot first approached him with the idea of switching the genders he wasn’t 100% sure but agreed to give the rewrite a go. Safe to say, he is now completely convinced of the musical’s new success and, believe me, it really works! The 2019 production’s cast recording has just been released and, if you can’t catch the last few weeks of this amazing show, check it out! [Company on Amazon]. Marianne Elliot was awarded the gong for Best Direction at the recent WhatsOnStage Awards, while Patti LuPone walked away with Best Supporting Actress for her magnetic performance as Joanne (a simply amazing rendition of “The Ladies Who Lunch”). Meanwhile, the show is celebrating an incredible nine nominations at the Olivier Awards, including Best Musical Revival, Best Direction, Best Actress (Rosalie Craig), Best Supporting Actress (Patti LuPone), and Best Actor in a Supporting Role (Richard Fleeshman and Jonathan Bailey respectively). Company was not the only musical to be re-worked and achieve phenomenal success this side of the pond in 2018. Kevin Murphy and Laurence O’Keefe’s Heathers: The Musical opened off-West End at The Other Palace, London in June 2018 and transferred to the West End’s Theatre Royal Haymarket for a 12 week run at the end of the year. Several changes were made to the original Los Angeles/Off Broadway production but the creative team remained the same. Led by director, Andy Fickman, two new songs (including the anthemic “I Say No”) were added to the London production along with several script changes. The show was a huge hit and was rewarded with the WOS awards for Best New Musical (defeating Hamilton!) and Best Actress in a Musical (Carrie Hope Fletcher). Sticking with musicals, there is one other production that has only recently opened but is already making huge waves in the West End. After proving itself to be a firm favorite in Toronto and on Broadway (and scoring seven nominations at the 2017 Tony Awards), Come From Away finally opened at London’s Phoenix Theatre in January this year. Although it was too late to be considered for the WOS Awards, Rachel Tucker (last seen on the West End and Broadway in The Last Ship) performed the hit number, “Me and the Sky”, as American Airline’s first female pilot, Beverley Bass. The show currently leads the way with Company, boasting nine Olivier Award nominations including Best Supporting Actress (Rachel Tucker), Best Supporting Actor (Clive Carter and Robert Hands respectively), Outstanding Achievement in Music, Best New Musical and Best Director. In the play categories, one production again leads the way in the UK theatre awards. Matthew Lopez’s The Inheritance is inspired by E.M. Forster’s 1910 novel, Howard’s End, updating the setting to contemporary New York City. Premiering in London in 2018 and directed by Stephen Daldry, this epic play is staged in two parts (each lasting three hours) and questions what it is like to be a young gay man in New York, a generation after the peak of the AIDS crisis. It won the WhatsOnStage award for Best New Play, and Vanessa Redgrave came away with the award for Best Supporting Actress as the only female actor in a predominantly male cast. The production has since been nominated for eight awards at the 2019 Oliviers, including Best New Play, Best Director, Best Actor (Kyle Soller) and Best Supporting Actress (Vanessa Redgrave). Meanwhile, Sir Ian McKellen received his 11th Olivier nomination for his portrayal of King Lear at London’s Duke of York Theatre (following a sell-out run in Chichester) and the play itself is nominated for Best Revival. Martin McDonagh’s Tony nominated black comedy, The Lieutenant of Inishmore, received a WhatsOnStage award for its lead actor, Aidan Turner, and has also garnered two Olivier nominations for Best Revival and Best Supporting Actor (Chris Walley). However, this writer’s top pick for the most heated head-to-head at the 2019 Olivier Awards goes to the category of Best Actress in a Play. Gillian Anderson (in the newly opened All About Eve) is up against Sophie Okonedo in her much lauded portrayal of Cleopatra in the National Theatre’s Antony and Cleopatra, Eileen Atkins in The Height of the Storm, Katherine Parkinson in the National Theatre’s Home, I’m Darling, and Patsy Ferran for Summer And Smoke. A very tough call! For a full list of the 2019 Olivier Award nominees, check out our list below and be sure to keep your eyes peeled on April 7!